FREE Shipping On Orders Over $25! DEALS: Buy 3 Get 15% Off, Buy 4 Get 25% Off, Buy 5 Get 35% Off, Buy 12 Get 50% Off! Look no further! ClearZal has all of your foot care needs backed by years of research and case studies! FREE Shipping On Orders Over $25! DEALS: Buy 2 Get 10%, Buy 3 Get 20%, Buy 4 Get 30%, Buy 5 Get 50% Off! Get Back To Bare Foot! Improving the appearance of your nails and feet damaged by fungus, psoriasis, or cracked heels can be daunting. Our products are tried and true, with 9 out of 10 users noticing a real difference. 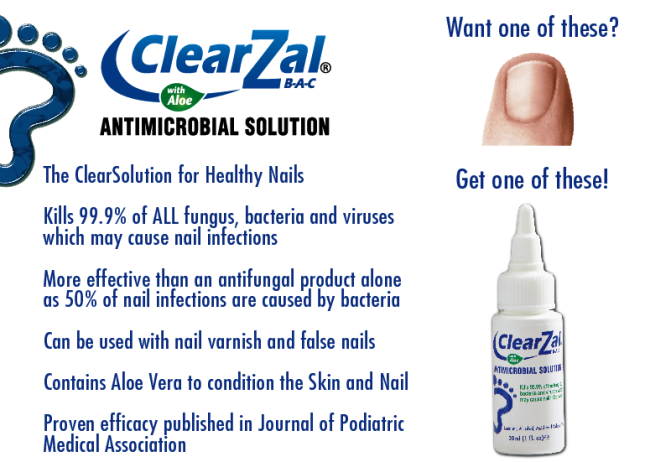 You’ll see the difference as ClearZal® penetrates deeply to help restore and nourish your feet and nails. 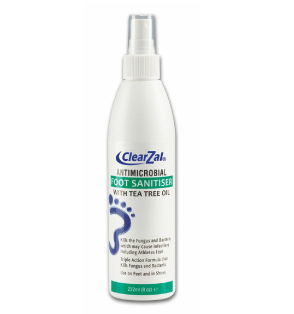 Shop ClearZal Foot Sanitiser Today! Copyright © Diaderm Laboratories, Inc. All Rights Reserved, 2018.